Just a simple “Following the ceremony we invite you to please join us for a cocktail reception.” is all you need to add to your invitations. Some guests may prefer to know not to expect a full meal in one setting, or even just reconsidering what shoes they may wear based on the idea of standing for longer! With smaller portions of food being served over several hours of the evening, the last thing you want is for any guests with dietary requirements to be missing out in between rounds, or getting hungrier as everyone else is happily eating around them! It’s important to get any dietary requirements up front so you can confirm the order of service with your caterers and ensure a smoother flow to the evening. Even after your guests have RSVP’d, it’s worthwhile doing a final call-out and double check with everyone attending if any dietary requirements have been missed (especially if you have guests verbally confirming their attendance). Whilst the idea of your guests having full service throughout the evening may be nice in theory, it does get awkward when the waiter is walking past and everyone is rushing over to clear the tray. 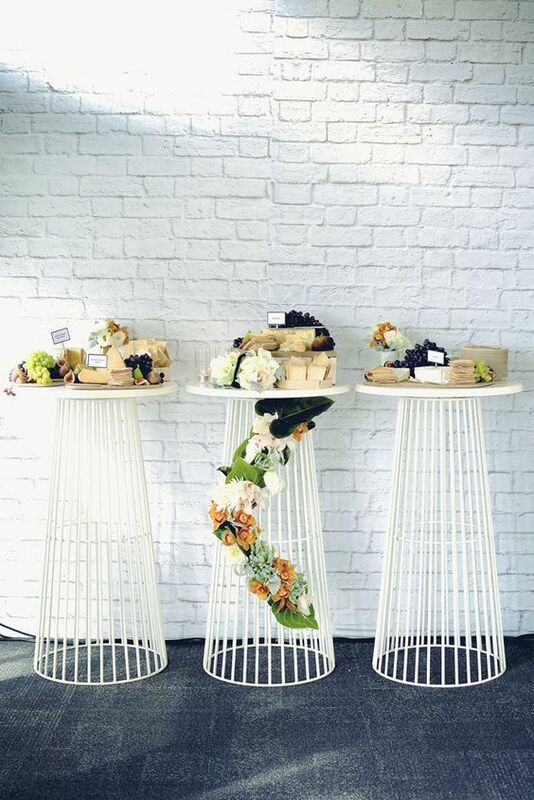 Setting up food and drink table stations is a great way to keep the service flowing more smoothly, and allow your guests to be able to help themselves as they choose. Of course you’ll need to consider whether you keep the food stations to be cold only, or whether you speak to your event and wait staff to be rotating any heated food that is being served. Similarly with drinks being topped up by staff, it’s also helpful to have a dedicated bar area that guests can seek out for themselves. 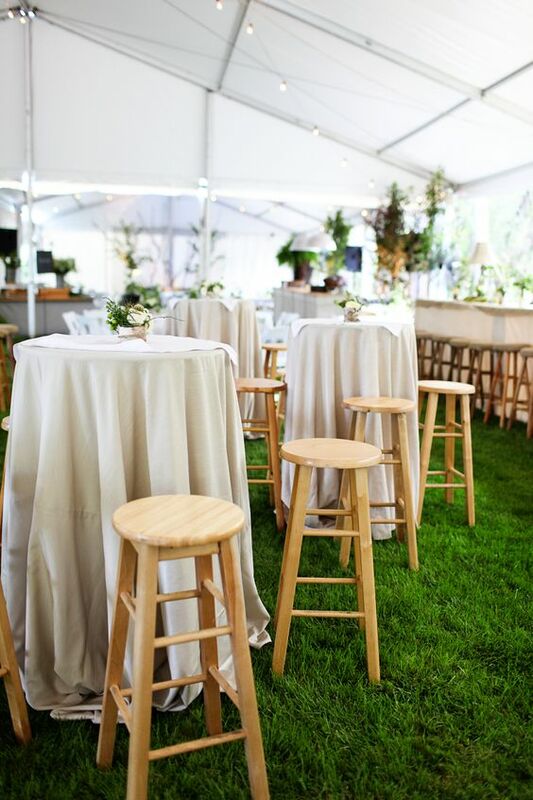 Mixed seating and tables are ideal for cocktail functions so that guests don’t feel stuck standing for the entire event, or being at a high table only. If you anticipate that your cocktail wedding reception will be going for several hours, having varied seating and standing options will keep mingling and socialising more interesting. Standing on your feet for the entire duration of your wedding reception event is quite a big ask! It’s recommended to hire enough chairs to seat approximately half the number of guests you have attending. You don’t want chairs to start taking up the entire event space, but at the same time you don’t want your guests searching for a seat the entire evening. Allowing for an approximate 50/50 of sitting and standing guests is usually a safe forecast. As mentioned in the point above, having a mixed chair and table arrangement is the best approach to maximise and utilise the space. Whilst the aim for your cocktail reception might be that you want it to be relaxed and informal, keep in mind that you still want the evening to flow smoothly. Creating an approximate run sheet for when you want key events to take place is helpful for your event staff to keep things moving, and for yourself and your guests to know what to expect. For example, what order would you like the food served in, when should the heavier/main-style food be served (even if it is finger sized), wedding speeches and formalities, dessert and cutting the cake etc. With a roaming event, having a floor plan will help ensure you have clear foot traffic flowing areas as well as dedicated spaces for your guests to hang around and mingle. It’s also important to consider things such as food and drink stations that will likely be busier during certain periods of the evening. Having a clear and simple floor plan will help you to best optimise your event space. Given your event is no longer around the service of a three course meal, if you’re planning on having a few speeches, spreading these throughout the evening is a great way to keep your guests engaged and bring a sense of togetherness for the crowd. Even if your wedding reception is only small, it’s advisable to hire a microphone for any speech. Not only does this ensure that the speeches carefully and loving curated by your closest will be heard, but you’ll all need a microphone for your MC to usher the crowd together to listen in. You can view our microphone and sound hire here. 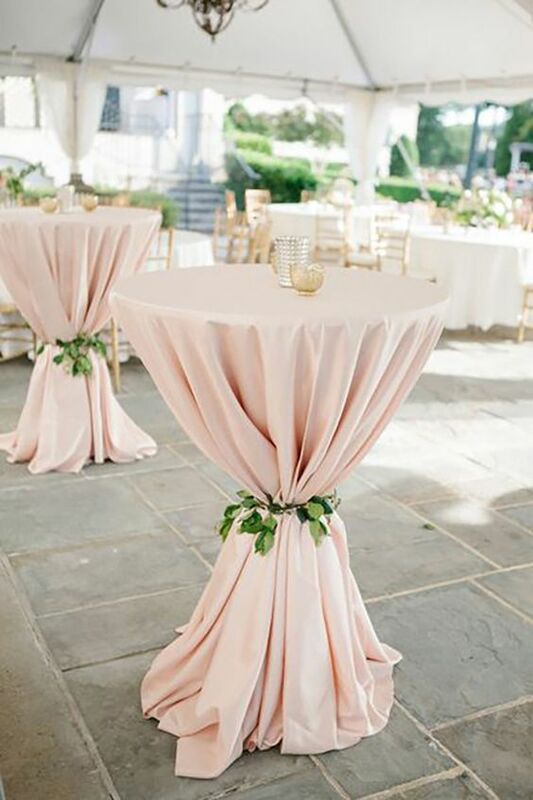 Whilst there won’t be any formal seating arrangements for your cocktail wedding reception, you will still want to consider where the bride and groom, family and bridal party will be during the speeches. This is easy to identify on your floor plan and is worth letting anyone required know in advance where you would like them to be during the speeches. Even if you don’t enjoy the limelight, your guests will want to see you as you’re being spoken about and giving congratulations. Without assigned chairs to hang jackets and bags, it’s not a pretty sight if each of your guests start draping their belongings all over the place. Providing a dedicated cloakroom will avoid this and you can always ask one of the waitstaff to supervise this earlier in the evening as people are arriving.